July 14 is the 100th anniversary of the birth of President Ford, and throughout the year, the Ford School has celebrated the legacy of his remarkable life. 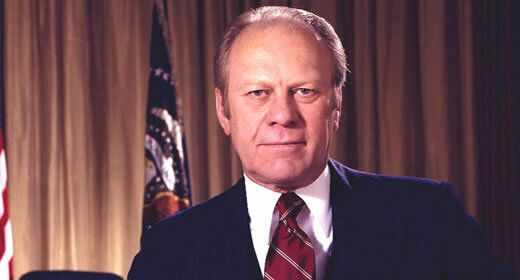 After decades of public service in the U.S. Congress, Gerald Ford took on the role of president during a politically tumultuous era. He led the country through that tumult with values that became the enduring hallmarks of his presidency: integrity, humility, and courage. This year-long celebration at his namesake school has provided a number of opportunities to reflect on President Ford's impact on public life and to engage with his family, friends, and colleagues. Since late fall 2012, the Ford School has hosted a variety of centennial events, including a University tribute to trailblazing First Lady Betty Ford; a visit from the Ford administration's energy czar, Frank Zarb; a screening of "Black & Blue", a documentary examining the lifelong friendship between Gerald Ford and Willis Ward; and an unveiling of a scale model of President Ford's statue from the U.S. Capitol, with remarks by Lt. Gen. Brent Scowcroft. As part of the Citi Foundation Lecture Series, the Ford School recently hosted a lively and insightful evening of policy reflections with eminent statesmen and Ford administration alumni Dr. Henry Kissinger, 56th Secretary of State, and Paul H. O'Neill, 72nd Secretary of the Treasury. Held in New York City, the lively and wide-ranging exchange offered insights into the Ford administration, as well as current international and domestic policy issues. Mr. O'Neill also delivered the Charge to the Class at the Ford School Commencement in May. "Across all of these centennial events, I have had the pleasure of meeting so many friends and colleagues of President Ford," notes Susan M. Collins, the Joan and Sanford Weill Dean of the Ford School. "Talking to them has revealed so much about President Ford's tireless focus on doing the right thing. I am struck by the enduring, positive impact he had on the country." Just this week, Ford School students and alums ("Fordies") from around the country and the globe came together in their respective cities to show school pride during the 3rd annual Worldwide Ford School Spirit Day, an alumni-led event. The Gerald Ford centennial events will be followed by the Ford School's own centennial in 2014.